For its current operations as a military base, see Joint Base Pearl Harbor–Hickam. 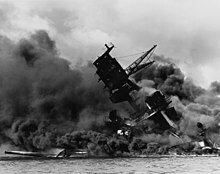 For the attack in 1941, see Attack on Pearl Harbor. For other uses, see Pearl Harbor (disambiguation). Pearl Harbor is a lagoon harbor on the island of Oahu, Hawaii, west of Honolulu. It has been long visited by the Naval fleet of the United States, before it was acquired from the Hawaiian Kingdom by the U.S. with the signing of the Reciprocity Treaty of 1875. Much of the harbor and surrounding lands is now a United States Navy deep-water naval base. It is also the headquarters of the United States Pacific Fleet. The U.S. government first obtained exclusive use of the inlet and the right to maintain a repair and coaling station for ships here in 1887. The attack on Pearl Harbor by the Empire of Japan on December 7, 1941, was the immediate cause of the United States' entry into World War II. Pearl Harbor was originally an extensive shallow embayment called Wai Momi (meaning, “Waters of Pearl”) or Puʻuloa (meaning, “long hill”) by the Hawaiians. Puʻuloa was regarded as the home of the shark goddess, Kaʻahupahau, and her brother (or son), Kahiʻuka, in Hawaiian legends. According to tradition, Keaunui, the head of the powerful Ewa chiefs, is cred with cutting a navigable channel near the present Puʻuloa saltworks, by which he made the estuary, known as "Pearl River," accessible to navigation. Making due allowance for legendary amplification, the estuary already had an outlet for its waters where the present gap is; but Keaunui is typically given the cr for widening and deepening it. Pearl Harbor in the 1880s. During the early 19th century, Pearl Harbor was not used for large ships due to its shallow entrance. The interest of United States in the Hawaiian Islands grew as a result of its whaling, shipping and trading activity in the Pacific. As early as 1820, an "Agent of the United States for Commerce and Seamen" was appointed to look after American business in the Port of Honolulu. These commercial ties to the American continent were accompanied by the work of the American Board of Commissioners for Foreign Missions. American missionaries and their families became an integral part of the Hawaiian political body. Throughout the 1820s and 1830s, many American warships visited Honolulu. In most cases, the commanding officers carried letters from the U.S. Government giving advice on governmental affairs and of the relations of the island nation with foreign powers. In 1841, the newspaper Polynesian, printed in Honolulu, advocated that the U.S. establish a naval base in Hawaii for protection of American citizens engaged in the whaling industry. The British Hawaiian Minister of Foreign Affairs Robert Crichton Wyllie, remarked in 1840 that "... my opinion is that the tide of events rushes on to annexation to the United States." From the conclusion of the Civil War, to the purchase of Alaska, to the increased importance of the Pacific states, the projected trade with countries in Asia and the desire for a duty-free market for Hawaiian staples, Hawaiian trade expanded. In 1865, the North Pacific Squadron was formed to embrace the western coast and Hawaii. Lackawanna in the following year was assigned to cruise among the islands, "a locality of great and increasing interest and importance." This vessel surveyed the Northwestern Hawaiian Islands toward Japan. As a result, the United States claimed Midway Island. The Secretary of the Navy was able to write in his annual report of 1868, that in November 1867, 42 American flags flew over whaleships and merchant vessels in Honolulu to only six of other nations. This increased activity caused the permanent assignment of at least one warship to Hawaiian waters. It also praised Midway Island as possessing a harbor surpassing Honolulu's. In the following year, Congress approved an appropriation of $50,000 on March 1, 1869, to deepen the approaches to this harbor. After 1868, when the Commander of the Pacific Fleet visited the islands to look after American interests, naval officers played an important role in internal affairs. They served as arbitrators in business disputes, negotiators of trade agreements and defenders of law and order. Periodic voyages among the islands and to the mainland aboard U.S. warships were arranged for members of the Hawaiian royal family and important island government officials. When King Lunalilo died in 1873, negotiations were underway for the cession of Pearl Harbor as a port for the duty-free export of sugar to the U.S. With the election of King Kalākaua in March 1874, riots prompted landing of sailors from USS Tuscarora and Portsmouth. The British warship, HMS Tenedos, also landed a token force. During the reign of King Kalākaua the United States was granted exclusive rights to enter Pearl Harbor and to establish "a coaling and repair station." Although this treaty continued in force until August 1898, the U.S. did not fortify Pearl Harbor as a naval base. As it had for 60 years, the shallow entrance constituted a formidable barrier against the use of the deep protected waters of the inner harbor. The United States and the Hawaiian Kingdom signed the Reciprocity Treaty of 1875 as supplemented by Convention on December 6, 1884, the Reciprocity Treaty was made by James Carter and ratified it in 1887. On January 20, 1887, the United States Senate allowed the Navy to exclusive right to maintain a coaling and repair station at Pearl Harbor. (The US took possession on November 9 that year). The Spanish–American War of 1898 and the desire for the United States to have a permanent presence in the Pacific both contributed to the decision. Following the overthrow of the Hawaiian Kingdom, the United States Navy established a base on the island in 1899. On December 7, 1941, the base was attacked by the Imperial Japanese Navy airplanes and midget submarines, causing the American entry into World War II. One of the main reasons that Pearl Harbor happened was because the United States had major communication breakdowns among several branches of the U.S. armed services and departments of the U.S. government. This led to the surprise Japanese attack at the Hawaiian air base. There was no meaningful plan for the air defense of Hawaii, for American commanders had no understanding of the capabilities and proper employment of air power. As it was, had the Pacific Fleet acted on the war warnings it undoubtedly would have sortied and been at sea on December 7, where the major ships would have been sunk in deep water, making salvage impossible. Shortly after the devastating Japanese surprise attack at Pearl Harbor two American military commanders, Lt. Gen. Walter Short and Adm. Husband Kimmel were demoted of their full ranks. The two American commanders later sought to restore their reputations and full ranks. In December 2016, Japanese Prime Minister Shinzo Abe made a joint visit to Pearl Harbor with US President Barack Obama. This trip marked the 75 year anniversary of the attack, and was the first official visit by a sitting Japanese leader. ^ "Pearl Harbor: Its Origin and Administrative History Through World War II". Naval History and Heritage Command. April 23, 2015. ^ FDR Pearl Harbor Speech. December 8, 1941. Retrieved 2011-02-05. December 7th, 1941, a day that will live in infamy. ^ Apple, Russell A.; Benjamin Levy (February 8, 1974). "Pearl Harbor" (pdf). National Register of Historic Places - Nomination and Inventory. National Park Service. Retrieved 25 May 2012. ^ "Places - The History of Pearl Harbor". National Park Service, U.S. Department of the Interior. Retrieved December 22, 2014. ^ "Cold Spots - Pearl Harbor - Dread Central". Dread Central. ^ Burtness, Paul; Warren, Ober (2013). "Communication Lapses Leading to the Pearl Harbor Disaster". 75 (4): 20. ^ Smith, Dale (1997). "Pearl Harbor: A lesson in air power". Air Power History. 44 (1): 46–53. ^ "Remember Pearl Harbor". Christian Science Monitor: 2. January 6, 1996. ^ Ito, Shingo (5 December 2016). "We did our jobs: Japanese participant remembers Pearl Harbor". www.atimes.com. Retrieved 7 December 2016. Wikisource has the text of the 1921 Collier's Encyclopedia article Pearl Harbor.